My household goes through jars of nut butter like it’s nobody’s business. Every single day, and I mean every single day, Alex and I both have either almond and/or peanut butter in some capacity. For me, I put almond butter in my post workout smoothie and I also put a good slathering of peanut butter on my toast for breakfast. As for Alex, he eats a scoop full of peanut butter with a drizzle of honey before he heads to the gym first thing in the morning. Although the almond butter we buy is just a simple creamy, unsalted variety, our go-to peanut butter on the other hand is more amped up with a crunchy texture, slight salty taste, and added nutrition from chia and flax seeds. We buy this amazing peanut butter from our forever favorite grocery store, Trader Joe’s, of course. One thing that I always wondered is why Trader Joe’s never decided to make an almond butter version, so I set out to make my own. And I gotta say, I’m so happy that I did because Alex and I both prefer my homemade almond butter version to any store-bought nut butter we’ve tried (peanut or almond). Surprise surprise. 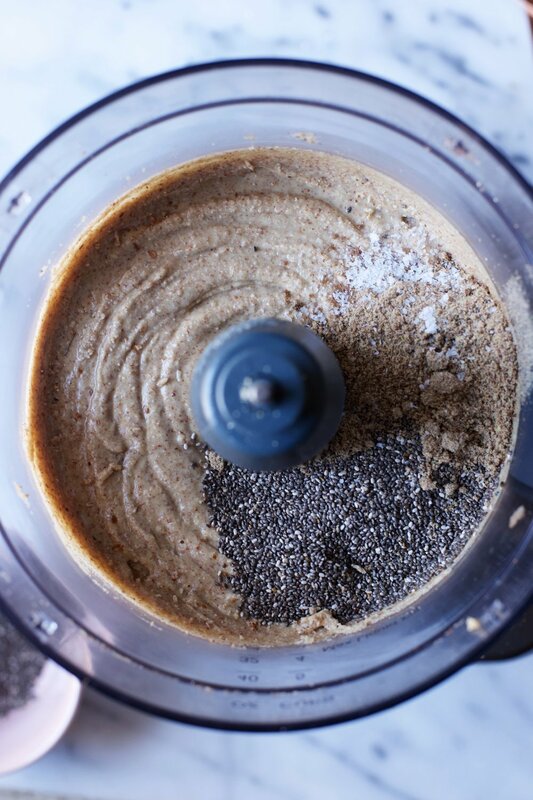 Making your own nut butter is fairly easy just as long as you have a high-powered blender, like a Vitamix, or a food processor. I own a Cuisinart food processor, so I’ll be giving directions on how to make the butter using a food processor, but the directions are identical if you plan to use a Vitamix instead. Once the almonds have completely transformed into a creamy mixture, that is when you will add in the salt and seeds. If you want to flavor it up a bit, go ahead and add whatever you’d like - cinnamon, vanilla extract, honey, maple syrup, etc..
After some research, I found that making almond butter is easier/quicker if you buy raw almonds and toast them yourself - the heat will allow for the almonds to break up more easily. Also, if you want to have a crunchier almond butter, set aside about a 1/4 cup of almonds after toasting them and give them a chop. When the almond butter is complete, hand stir the almonds in and you’ll have a very nicely textured butter. If you’ve never made a nut butter on your own, I highly recommend it! It’s a pretty fun process and undoubtedly gives you a much better flavor then what you’d get from the store. Preheat the oven to 350°F. Spread the almonds evenly on a rimmed baking sheet and toast them in the oven for about 10 minutes, giving them a stir halfway through. Allow the almonds to cool slightly before transferring them to the food processor, about 10-15 minutes. If making a crunchy almond butter, set aside 1/4 cup of almonds and give them a good chop. Place the almonds in the food processor fitted with the s-blade and blend on “high". The almonds will go through various stages of consistency - they will be powdery, then begin to form clumps, and then will eventually form one massive clump. Throughout this process, you will have to keep on eye on the food processor and break up the mixture with a spoon or the back of a spatula. If may seem like it’ll never become creamy, but trust me, it will! The whole process can take about 10-15 minutes depending on your machine, so you’ll just need to be patient. Once the mixture is creamy, add in the salt, chia, and flax seeds and pulse until incorporated - this is when you can add in any other ingredients of your choosing. Stir in the reserved 1/4 cup chopped almonds with a spatula (if you’re making a crunchier almond butter). Allow it to cool to room temperature. Transfer the almond butter to a mason jar and store in the fridge. Enjoy on toast, apple slices, in smoothies, or on its own.